Oatmeal is a breakfast staple for many, and in the fitness community, it’s continued to be a cornerstone of morning to this day. Remember ripping open those packet of your favorite flavor of instant oatmeal and enjoying a piping hot breakfast before you’re off to school? Now as an adult, you’ve probably upgraded to bulk rolled oats or even the occasional slow-cooking steel-cut oats, and many of us add a heaping scoop of protein powder to up the protein count and enhance the flavor. “Proats”, as we call it! Unfortunately, we’ve all had those occasions when a clumpy protein powder just doesn’t mix right in oatmeal or didn’t deliver on the flavor for whatever reason. Well, PEScience is making your daily serving of proats tastier and easier with the release of Select Protein 4 Oats, a protein powder specifically designed to be added to oats! This stuff is way more for real than we ever imagined!! Select Protein 4 Oats is pretty simple when you get down to it. It’s the same great tasting protein blend you’ve come to know and love from PES, with the addition of some other unique flavoring components to deliver a product that is sure to become a staple of oat lovers of all kinds. 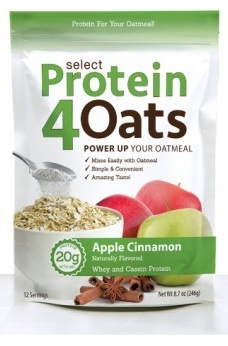 Protein 4 Oats uses the same protein blend as found in the incredibly popular and delicious tasting Select Protein. WPC-80 is one of the best quality whey concentrates you can have in a protein powder; it’s 80% protein by weight, meaning there’s less carbs, lactose, and fat than in lower grade whey concentrates like WPC-35. This helps keep the protein content high and carb / fat count lower in Protein 4 Oats. 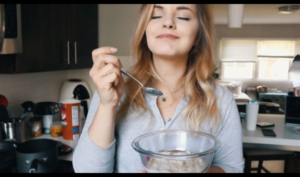 Oats for breakfast alone is simply not enough – we need protein! A study that dieters who consumed a whey protein shake before breakfast lost more weight than the control group, also sparing more muscle tone! With Select Protein 4 Oats, you can combine the two and keep more of that muscle tissue while dieting — but having some of the protein replace some of the carbs in your diet will help balance your macronutrients for the better. Peanut flour is a flour made from pulverized peanuts. [3,4] Following whole peanut demolition, the bits are defatted, and what’s left is a fine powder that is high in protein, and low in fat. Peanut flour is great in baked goods, shakes, waffles, and oatmeal, which is why it’s included in here. It can even be mixed with water to make a lower-cal protein powder should you be dieting but don’t want to give up your favorite flavored nut butter. Morning oatmeal just got a much needed flavor upgrade. The rest of Select Protein 4 Oats blend contains the usual host of ingredients found in other protein powders — salt, sucralose, and acesulfame potassium, but there’s also the addition of granulated honey. This honey probably lends a unique flavor and different type of sweetness that’s not achieved with non-nutritive sweeteners like Ace-K or sucralose. Note: Your final macros will of course depend on how many oats and if you use milk or water. PES Athlete Marie Wold is all smiles over the Protein 4 Oats…will the public be as pleased with the product? Finally, some protein made for oats from a company that seriously knows how to flavor their protein! Select Protein 4 Oats may seem unnecessary to some of you, but once you buy a protein that just doesn’t mix in oats, you’ll understand. In truth, you could keep risking it, but if you’re willing to have an extra bag in the pantry, PEScience has done the hard work for you. Save your other protein powder for water or milk and stop wasting it on clumpy oats! 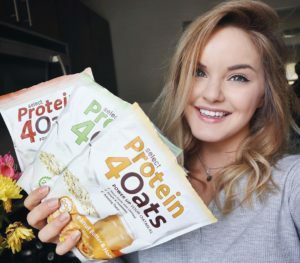 With a dedicated flavoring and mixing system that designed with oats in mind, Protein 4 Oats is for those of us who want our two favorite foods to come together properly, delivering a superior breakfast experience. Check out all three flavors! No Comments | Posted in New Products, Supplement News | Tagged Acesulfame Potassium, Honey, Milk Protein Isolate, Peanut Flour, PES, Protein Powder, Sucralose, Whey Protein, Whey Protein Concentrate.